I first saw Rory Gallagher on stage, outdoors, playing a brief set in the Boston Commons in the summer of 1971. Fleetwood Mac was also on the bill, and I think the other band was either Status Quo or Canned Heat. It's been too long. Rory opened up and played for maybe 40 minutes. He was terrific. Well, I can't say for sure he was terrific, but I knew almost instantly that I would be a long-time fan. His attitude was so unusual -- so non-rock-star. An Everyman. I later saw Rory perform at basketball arenas in Evansville, Indiana (opening for The Faces in 1973 or 1974) and in theaters in St. Louis (with Black Sabbath, I'm pretty sure). At that time Donal, his brother and manager Donal, was kind enough to arrange an interview with Rory after that show, which had a couple of thousand people fairly well rapt. Perhaps the most memorable setting was during the early 1970's in a tiny (elementary school size) gymnasium out in the country not far from St. Louis. The town was Washington, Missouri. It was not the easiest spot to find (for fans or rock bands, I would assume). It was a weekend afternoon and two other acts also played -- The Flock and Brownsville Station. Rory was a bit late arriving, as I remember, but set up quickly and played for at least two hours. Every one of the rock fans -- not more than two hundred -- attending there probably thought Rory had mistaken this pint-size room for a major concert venue. He gave it everything he had and then some more. In the mid-1980's I saw Rory open up at McNichols Sports Arena for Rush and, judging by his energy level alone, he played with the same gut energy and enthusiasm for a crowd of 200 as he did for 16,000. Rory was a consummate performer. Donal was kind enough to let me say hello again to Rory backstage. If being a musician was Rory's best talent, being host was a close second. Never anything but humble, kind, and earnest to his guests. I also saw him at The Starwood in Los Angeles in late 1978 and watched him run through a 25-minute sound check. I recorded the sound check on a cheap, beat-up tape recorder and to this day occasionally listen to him rip through a few songs and riffs, including an instrumental bit of the Beatles' "Words Of Love". Even Rory Gallagher can't explain it. "I don't recognize myself up there sometimes or I don't recognize myself when I come offstage", he says in the barely-audible tones that are a marked contrast to his growling voice and sweat-drenched performances on stage. "I don't know, I could go from being John Smith, to being John Smith with the lights on. I'm not aware of this Jekyll and Hyde change but if I was as crazy offstage as was onstage, people would lock me up, or they wouldn't talk to me. It's the sound of the people, the enjoyment of playing, the release of playing that gets me up. I know when I hit the stage I want to kick it out and cause a little rumpus. If you're out front, I think you must get down there, tooth and nail'". 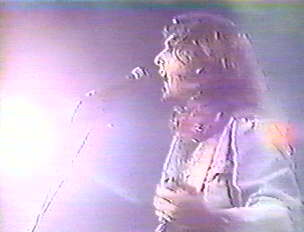 Tooth, nail and fingerpick, anyway; which is just what Rory Gallagher brought to his early December Starwood gigs, delivering exhausting, brass knuckles rock and blues. The Starwood gig, near the end of a four-week club tour, was Gallagher's first in Los Angeles in nearly two years. And even though it was outside a Sunset Strip hotel nearly two years ago that Rory broke his right thumb, he said he won't hold it against the city, and, following a European tour this winter, may temporarily settle on the west coast to keep the pressure on in his push for the big time. Those assembled for the Starwood gigs would clearly welcome Rory in residence here. They were hungry for the sound of a guitar with Gallagher in control. In return, Gallagher dipped deep into his supply of energy and enthusiasm, displaying his masterful work on guitar with child-like exuberance. His fingers flew, searching out notes, it seemed, on sheer instinct. His whiskey-salted voice barked and snapped, and throughout he taunted and teased the crowd, as much a showman as Bruce Springsteen. There was the pump-it-up rocker "Shin Kicker" for openers. Then the chunka-chunka "Do You Read Me?". And the biting "Bought And Sold" followed by the straight blues "I Wonder Who", transcending the token three-chord-wonder obligatory numbers done by most bands. This is Rory's home turf, the stuff of his soul. Rory's fingers danced for all they were worth. "Some critics say, he is only doing rock and blues and he's not changing", said Rory between tongue-wetting sips on Seven-Up and whiskey after the Starwood sound check. "People expect me to do something that is a fake change. Well, I could do a fusion album, or do a reggae album and wear a cowboy hat, but that's just playing games with the media. There are very few people doing good meat and potatoes music with interesting songs". Irish-bred Gallagher has nine solo albums out, plus four with his late-1960's blues trio Taste. He has toured the States thirteen times, and has a loyal, sizable following in Europe. But American success has been spotty and elusive. With the sparkling new album, Photo Finish, his first all-electric effort, Gallagher is optimistic about his future but befuddled by the state of his art. "Things have gotten very formal; so much disco and a lot of bands that are just pre-fabricated corporations. In England the bands were getting so big it had to be Shea Stadium or nothing, and it had be 15 limos and a Cecil B. DeMille stage. So at least there is a sobriety that the new wavers brought in. But then some of the new wave people pretend they were born yesterday and pretend they never heard of Eddie Cochran or Muddy Waters". Heartened by the success of Bob Seger, who plugged away for years before national recognition, and by Bruce Springsteen, who Rory admires and feels affinity with because of his simple human approach to performing, Rory remains confident. "I'd love to be as big as Springsteen or Seger by all means. My long-term ambition is to have a top-ten album in America, and to get that you have to be ambitious. But if the ambition overrides the fun of it, you're in trouble." "Some people see me as the last crusader of the blues or some kind of independent because I do a certain amount of things my own way. I don't mind being an independent," he says, speaking in a loud, normal onstage voice for the first time, "but I don't want to be the last of anything." Copyright c 1996, Mark Stevens. Mark Stevens worked for the Denver Post and the Rocky Mountain News in Colorado. He was a national field producer for the MacNeil/Lehrer NewsHour on American public television. Mr. Stevens made his connection with Rory initially as a reporter for The Christian Science Monitor where he wrote music and rock features. He also reviewed one of Rory's concerts for The News at McNichols in Denver, and wrote as a freelancer for the Los Angeles based magazine TRIAD.